Each nation has wedding traditions and rites, which are passed on from generation to generation. All of them arose not from the ground up and they are full of meaning and symbolism. Of course, many traditions have been modified and modernized with centuries, but, nevertheless, they retained their significance and importance. Despite the change of generations, the change of fashion and modern predilections of the newlyweds - the strength of Ukrainian folk traditions is very powerful. Therefore, until today the matchmaking ceremony and parental blessing of marriage have been preserved as a beautiful and sacred custom in Ukraine. Each modern couple decides on their own what role will be devoted to wedding traditions, but still a man and a woman remember the most important of them before they decide to get married. In this article we will talk about the significant and indispensable components of the Ukrainian matchmaking ceremony, the parental blessing ceremony for a young couple and about such an important attribute as a national wedding towel. Ukrainians have always cared about their future, especially about the continuation of the family and the stable family. It has always been believed that the marriage will be happy if the newlyweds and their families do a number of rites, entrusted by ancestors. So, certain rituals, held by appropriate actions, songs, charms and dances formed the basis of the Ukrainian folk wedding. People believed that if the newlyweds had no ritual event, then the wedding couldn't happen at all. The pre-wedding stage in old times included matchmaking, when the bridegroom proposed marriage to his girlfriend in the presence of her parents. No wedding was conceived without matchmaking and it was one of the main stages of the celebration. The future bridegroom himself could participate in the matchmaking, or he could send the matchmakers to the parents of his chosen one. Traditionally, matchmaking was held with the obligatory participation of the matchmaker, who played a central role in this process. Which one? Traditionally, no Ukrainian wedding was held without the matchmaker. The matchmaker, as a rule, was a woman from the close surroundings of the bridegroom, more often his godmother. It was the matchmaker who had the honor of proposing marriage to the beloved of the bridegroom. And often the fate of young people depended on the eloquence of the matchmaker. Matchmaking, or as it's accepted to be called “engagement”, was held in the house of the bride's parents. And in order to have successful matchmaking, the matchmaker had to do a number of certain magical actions. For example, to tie the legs of the table, so that the wedding goes well or to wind the chimney with a cloth so that the bride is easier to «ensnare». If matchmaking was successful, then the matchmaker had the place of honor at the further wedding. In addition, she had to prepare the bride-bed for the newlyweds. Today, the role of the matchmaker is usually performed by the bridegroom's mother, a married elder sister or a friend of the bridegroom. In some regions of Ukraine matchmaking looked like a presentation of a marriageable girl: the bridegroom's parents could see the future bride and evaluate her merits and demerits. The matchmakers talked about the merits of the bridegroom and asked about the talents of the bride. It was the matter of the whole family. And after the agreement was reached, the parties passed on to discuss the marriage contract. The main object of the presentation of a marriageable girl and matchmaking was the conclusion of the property agreements, the determination of the economic basis of a new marriage. The matchmakers were interested in the dowry for the bride. And her parents were worried about the material support of their daughter by a future husband and the opportunity not only to pay for the wedding, but also to ensure the comfortable life of the whole future family. There was a custom in accordance with which the bridegroom had to give money for wedding gifts. Not only money could be presented as a gift, but also clothes, food. Of course, as far back as at the beginning of the twentieth century, during matchmaking people were talking about the cattle the father was going to give with his daughter and the land territory he will grant, and later, within the Soviet period, money or household things were chosen to be the dowry. Also people stipulated for the time and conditions for their payment, as well as the number of gifts from both sides and the number of guests at the wedding. The successful negotiations ended with a handshake. Then the wedding stage included a hen party, the baking of a round loaf and the decorating of a ritual tree. In the traditional wedding culture of all regions of Ukraine, bread and towels have always played the most important role. People believed that matchmaking without bread could not be considered to be matchmaking at all. For central Ukraine, the exchange of bread was a special rite: it's important that the parents of the bride give their baked goods to the matchmakers. If the hosts of the house didn't want to exchange bread, it meant that they didn't accept the proposal of marriage. The same meaning had the pumpkin brought by the girl or her parents. The modern bridegroom usually goes to the bride's parents on their prior consent, having two bouquets - for the future wife and the future mother-in-law - as well as small gifts for the other family members. If the parents of the bride and the bridegroom are not yet acquainted, then the girl introduces them to each other, starting with her father. The matchmaker - father, godfather, uncle, family friend, in other words, the elder man from the bridegroom's family - can usually come together with the bridegroom. However, the bridegroom can simply come with his parents - his father and mother, to make the acquaintance of the bride's parents. As of today, the matchmaking in Ukraine is more an acquaintance of parents in the house of the bridegroom or bride. During the celebration, they discuss details of the forthcoming event, decide on preparation duties and solve the financial aspect of the matter. The evening of the end of this matchmaking is ideal for the engagement. A young couple announces their desire to marry. The bridegroom puts the wedding ring on the bride's finger, which she wears until the day of the wedding. It can be either a special bought decoration or a family heirloom. The consent of the bride's parents is consolidated by the tying of the newlyweds' hands with the wedding towel. The tradition of using embroidered towels during the wedding ceremony has a long history, and Ukrainian people know the value of this wedding attribute. It was and still remains a multi-function wedding accessory. A wedding towel is an embroidered decorative towel made of linen cloth. The ideal size for it is 35-40cm in width and 3-5m in length. In the past, the bride embroidered them with her own hands, preparing a dowry for her wedding. And, according to the popular beliefs, the embroidery on wedding towels was a kind of amulet for the newlyweds, a protection against evil curse and the evil eye. The bride had to be in a good mood while embroidering a towel and pray, as she was creating her future with her husband. Therefore, the towels in Ukraine are also called the «foundation» of the family life. At present, it can be bought at any wedding salon or ordered from a professional needlewoman. Parents were meeting the newlyweds with towels, and the icons and wedding round loaf were presented on it. Moreover, during the wedding ceremony, and today during the official marriage part at the registry office, the bridegroom and bride must simultaneously make the first step, standing on the towel. Ukrainians believe that the first one, who made a step, will be the leader of the family. As in old times, and at present, four types of towels are considered to be the main ones at the wedding: the parental one - the newlyweds kneel on it for blessing, the union one - the newlyweds' hands are tied with it, the wedding one - for the rite in the church, and the hospitable one, with which a young family is greeted after they get married. After the matchmaking ceremony, the most popular tradition in Ukraine is the parents' blessing of their children. The main idea is that the most important people in the couple's life, their parents, bless the creation of a new family. In old times the wishes and parental blessing were a very beautiful and touching rite. According to the Bible, God gave parents a special power over their children, which they had to use wisely and with love. Therefore, until now, Ukrainians are so serious to this rite of blessing. The main condition is that both parents and newlyweds should be christened. Such a marriage will be strengthened in heaven, even if the newlyweds are not going to get married in a church. It was believed that if children didn't get the blessing of their parents to marry, then they wouldn't live happily and their family would have an unhealthy posterity. They were even refused to be married in a church, they were deprived of all benevolence and were condemned. But if the parents accepted the choice of their children, then the blessing was held several times - during matchmaking, after the final decision on the wedding, separately for the bridegroom and the bride, and then for the young couple before the wedding celebration. At present, everything is much easier and more often has a formal nature. Only deeply religious people stick to the old customs. Not only parents can take part in the rite of blessing, but also the godparents of the newlyweds. The main thing is that all those present should be christened. Nowadays, in Ukraine, on the wedding day parents address the bridegroom and the bride with words of encouragement separately, each in their own house. And then they jointly bless the young couple in the bride's house, accompanying them to the registry office. Before the wedding ceremony, it's accepted to accompany separately the bridegroom from the parents’ house. On the table covered with a new white tablecloth, parents put the fresh-baked bread, some water and salt, and light a candle. The bridegroom's parents take the icon of Christ the Savior and bless the kneeling son. Then the father ties the bridegroom's hands with a towel and turns him three times around the table. They are followed by a mother carrying an icon and a candle. In this way, the parents confirm the support of the family to the son and address him with words of encouragement before the registry office, saying the words of blessing. The send-off of the bride is held in her parents' house on the same principle. Addressing the bride with words of encouragement before the wedding, the parents bless her with the icon of the Mother of God. Just like the bridegroom, the girl, girt with a towel, is three times turned clockwise around the table by her father. After the words of blessing the father brings the bride to the bridegroom and passes her hand to him. 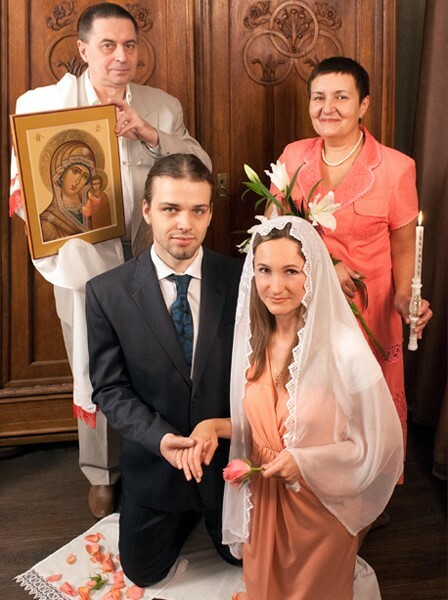 According to the rite, the parents bless the newlyweds with an icon, but if the families are not religious, then the parents can just express their wishes. Usually, in each family there is a holy icon, parents bless the newlyweds from generation to generation with. In front of these icons, the parents give their consent to the marriage of their children and cross them with an icon. Then this icon is passed on to children and grandchildren from generation to generation and is kept as a family heirloom. It's accepted to bless the bridegroom with the icon of Christ the Savior, and the bride - with the icon of the Blessed Virgin. After that the bridegroom and bride cross themselves and kiss the holy icons. This custom of blessing with an icon means that the parents no longer participate in the upbringing of their children and pass them to the intercession of God. If one of the parents of the bridegroom or bride is dead, then the living parent blesses, or it can be done by godparents. In the past, their participation in this rite was obligatory, and now it's extremely rare. The parental blessing for the life of a couple is not just a wish for happiness and love, it's the parental approval of the choice of their son or daughter of a partner in life. In addition, it's also an important moment of closer relations between the newlyweds and their parents. It can’t be done in a different way as parents, who always want their children to be happy and healthy, are the closest and dearest people to the bridegroom and bride. They take care of them all their life and are very worried during the blessing. These moments are very touching which can't be held without tears. The newlyweds, in their turn, after listening to the wishes, thank parents for their upbringing and kiss them three times according to the Slavic custom. After that, the bridegroom and bride bow and then the couple is accompanied to the wedding cortege with a wish of happiness and well-being, being sprinkled with grain, coins and sweets. 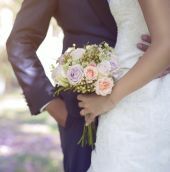 Newlyweds can be sure that the life of their young family will be joyful and happy, full of understanding, tenderness and love only if they get wishes and parental blessing before they head to the registry office!